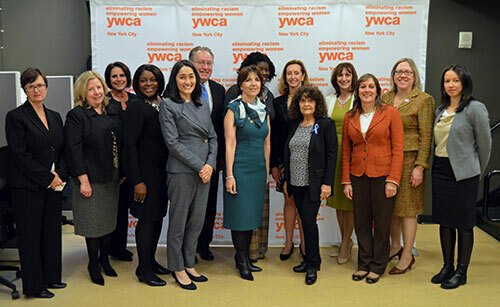 The YW Academy of Women Leaders of the YWCA of the City of New York met at Berkeley College in Midtown Manhattan on December 3, 2017, to continue important conversations that address how women can move outside their roles in their firms and to become part of a bigger community, and to welcome the 2017 inductees. The Academy is a network of 3,000 women leaders. Michael J. Smith, President of Berkeley College, also addressed the group. “Seventy percent of our students are female. Our mission and goal is to partner with groups in the community that can provide strong role models,” President Smith said. The program’s panelists included Martina Cheung, Head of Global Risk Services at S&P Global, and Lisa Dolly, CEO for Pershing, a BNY Mellon company. 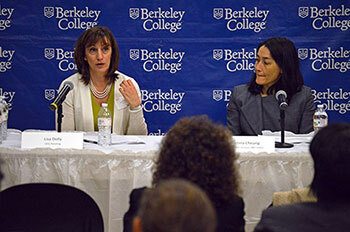 Diane Recinos, EdD, Senior Vice President, Student Success, Berkeley College, was the moderator. “You can do no greater good than provide access to your network of women who are looking to advance,” said Ms. Cheung. Photo Caption (Top): Important conversations continue to address how women can move outside their roles in their firms and become part of a bigger community among members of the YW Academy of Women Leaders at the program held at Berkeley College in Midtown Manhattan. Panelists, left to right, are Lisa Dolly, CEO for Pershing, a BNY Mellon company, and Martina Cheung, Head of Global Risk Services at S&P Global. (Bottom): Past and present members of the YW Academy of Women leaders share the spotlight at Berkeley College in Midtown Manhattan. Standing, third from left, is Diane Recinos, EdD, Senior Vice President, Student Success, Berkeley College; fourth from left, Natalie Borneo, Chair, YW Academy of Women Leaders Committee; sixth from left, Michael J. Smith, President of Berkeley College; center, Rosemarie Bonelli, Interim President, YWCA of the City of New York; and fifth from right, Annette Long, Vice President, Central College Administration, Berkeley College.